This stretch starts at Cape Cornwall. If you have made a detour into St Just, follow the road past the school and continue for a mile or so until you reach the coast. 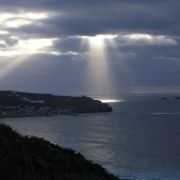 If you have clambered across the rocks at Porthledden you will emerge directly at the northern side of the Cape. 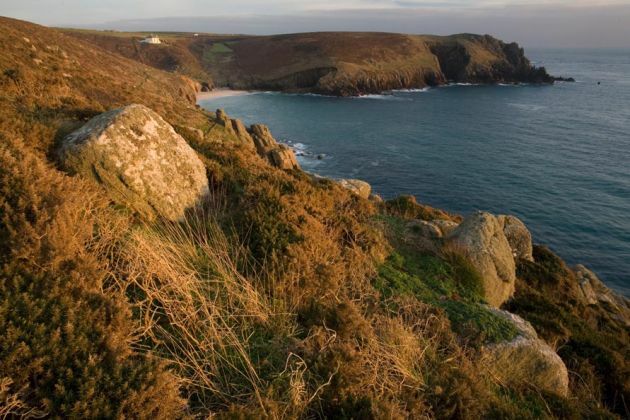 Cape Cornwall is a gorgeous, wild, windswept place, well-known for passing migratory birds like shearwaters, gannets and kittiwakes, especially during the late autumn gales. The path skirts behind the headland but if you have time it is worth the short walk around this tiny peninsula, which was bought for the nation by H.J.Heinz Ltd and given to the National Trust in 1987. The jagged granite islands you can see a mile out to sea are notorious for wrecks and are said to have been used in the distant past as a particularly desolate prison. Every year locals race back from these granite outposts, called the Brisons, to Priest's Cove (on the more sheltered southern side of the Cape) in a long-established Atlantic swimming race. Priest's Cove is still a working fishery and small fishermen's huts have been built into the rock for mending nets and storing crab and lobster pots. Geologically complex the cove marks the boundary between the dark metamorphosed sedimentary rock of the north coast and the distinctive smoothed granite that defines the west Penwith coastline. If you fancy a dip in the sea look out for a man-made swimming, fashioned out of the rocks and accessible at most stages of the tide. 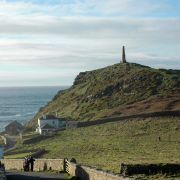 There is a refreshment van and National Trust information point in the Car Park at Cape Cornwall from Easter until October. The path follows a track that leads away from the cove and then turns sharp right. Steep and stony the track leads steeply to the top of the cliffs at Carn Gloose, which offer magnificent views all the way to Sennen and Land's End. Continue along a tarmac road a short way until you see a path bearing right, or detour a few hundred yards further to see Bollowall Barrow (just to the right of the tarmac road). This is an outstanding and complex early Bronze Age burial cairn that survived exceptionally well due to being buried for many years under mine waste. The size and complexity of this ancient monument will send shivers down your spine! Watch out for open mine shafts on the way down to Cot Valley (don't stray from the path), which is an attractive sheltered cove at the bottom of a lush valley. There is a youth hostel here, a little way upstream. Climb out of the valley on any one of a number of paths that lead to a lovely stretch of unspoilt cliff top mostly managed by the National Trust and riddled with pre-industrial mine workings (not all visible) that date back to at least the 17th century. The cliffs of Boscregan and Nanjulian lead to Nanquidno, an almost deserted valley strewn with boulders where the Nanquidno stream meets the sea. 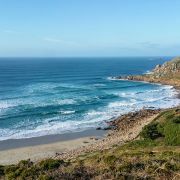 From here it's a short and strenuous walk to Aire Point, the headland that gives way to the remote, sandy beach known as Gwenvor and its busier sister, Sennen, or Whitesand Bay. Although joined at low tide, Gwenvor and Sennen are very different in character. The former is only accessible by means of a flight of very steep steps from the top of the hill. It is the most exposed beach in Cornwall and picks up more swell than anywhere else in England. Very popular with surfers, the beach manages to avoid overcrowding due to the combination of dangerous currents, big waves and inaccessibility. The path climbs just a little way to run along the base of the cliff to Sennen. (At low tide it is often possible to clamber over the rocks). 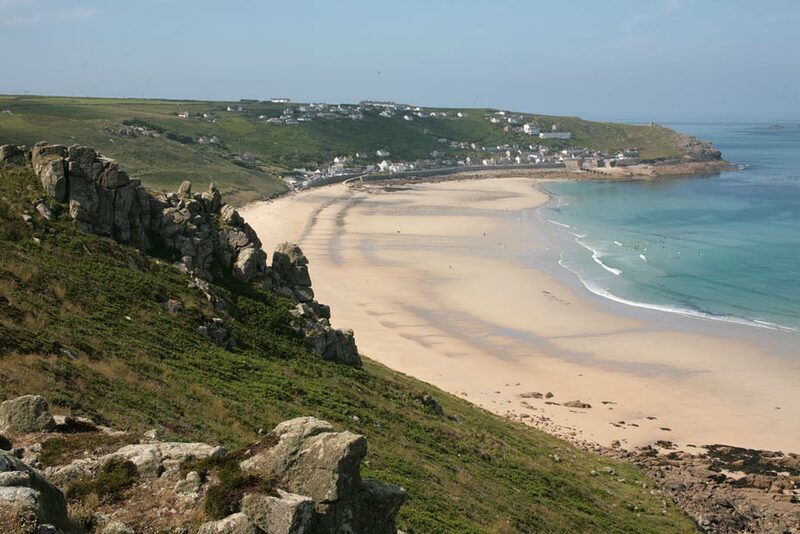 The north end is backed by dunes and often deserted but as you approach the southern end, either along the sand, or following a footpath through the dunes, you are likely to encounter more and more people, and in the height of summer there will probably be hordes, clustering around the cafés, car parks, pub and surf shop of this remote cove, sheltered from the worst of the wind by the bulk of Land's End. There are two surf schools operating on this long, sandy beach, which is almost always smaller and safer than its neighbour, and it is usually possible to swim, with lifeguards operating in summer. Go through the car park and along the tarmac road with the sea on one side and houses on the other until you reach another car park. Go through this car park and follow a path that climbs the cliff towards a former coastguard station that sits on top of a rocky headland. 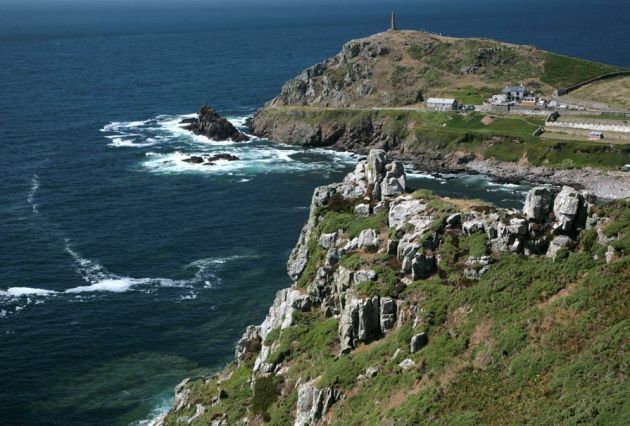 This is Pedn-men-du, from where there are great views of Longships lighthouse, Land's End and Sennen beach. The coastguard station is now National Trust information point with resources relating to the surrounding areas. 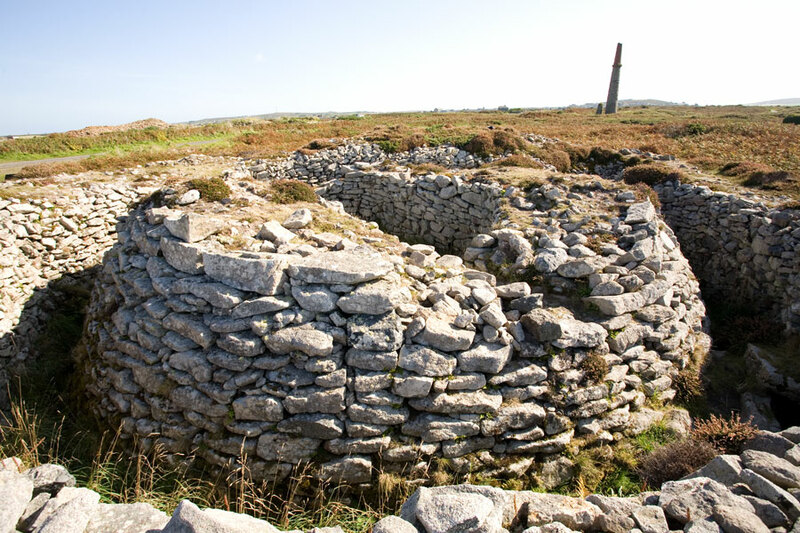 As you continue along the cliff towards Land's End look out for the remains of Maen Castle, considered to be the oldest of all the Iron Age cliff castles in West Penwith, and possibly dating from as early as the 5th century BC. Land's End leaps in a surreal fashion out of the surrounding landscape like a Butlins in the Antarctic. It is possible to avoid the worst of the excess by remaining firmly on the seaward side and looking determinedly at the edge of the cliff (which is beautiful, especially the famous and much-photographed arch). Climb over a fence via a stile and once again you will find yourself on a deserted cliff top. If you do need the toilet, or food, or want to buy a tacky souvenir, you may wander the complex on foot without paying an entrance, although if you want to visit any of the 'attractions' an extortionate fee will be charged. 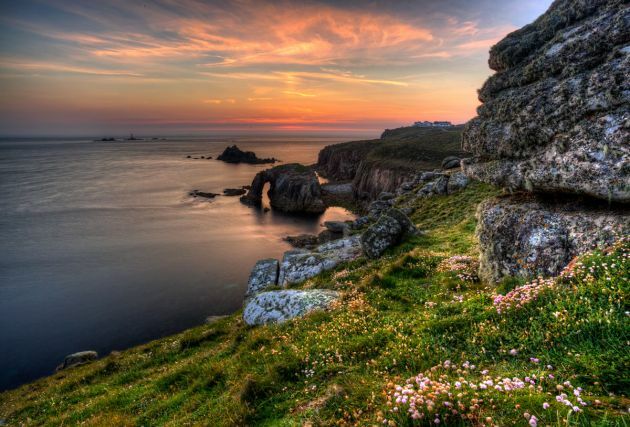 After Land's End comes one of the most stunning and unique stretches of footpath in the British Isles. You are walking right around the bottom of the country, and it is possible to see clearly a shift in the landscape as you change direction at Gwenapp Head and begin walking north, along the more sheltered south coast. A few miles south of Land's End lies Najizal, a stunning beach protected from the crowds by extreme inaccessibility and inconsistent sand. Rock pools, arches and caves abound, creating an ideal habitat for seals. It is sometimes possible to swim here but beware of dangerous currents. Head inland from the beach after crossing a wooden bridge until you see a very long flight of wooden steps leading off to your right. These will bring you back to the top of the cliff. This section of path is highly memorable. There is a profound sense of space. 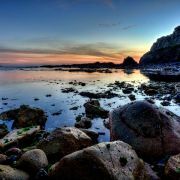 Big skies, heather, huge boulders and high cliffs with barely any sign of human habitation, give way to a restless deep blue sea that churns endlessly into countless inaccessible coves. At Gwenapp Head you have the option of taking a short cut down a tarmac road into Porthgwarra. 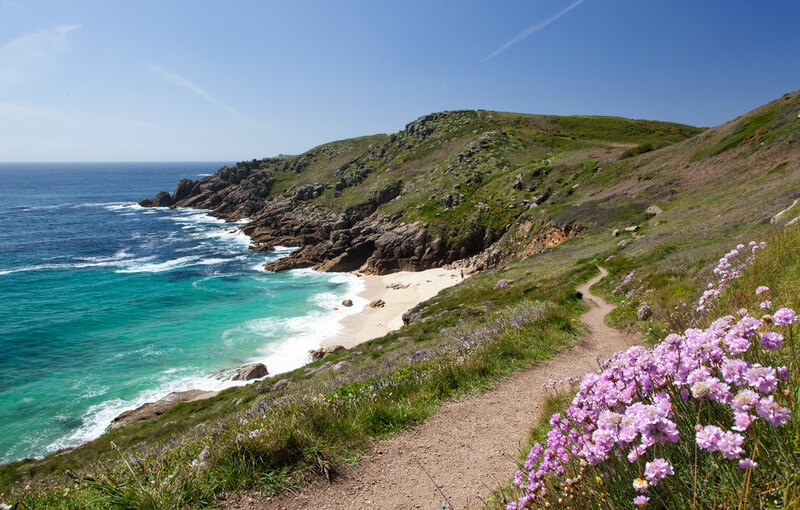 If you do have the energy, however, it is recommended that you continue along the path closest to the sea, following the contours of what is the most southerly spot in England (the actual Cape). Look out for an impressive blowhole. There is a small, seasonal café in Porthgwarra, and the cove is safe for swimming although often full of seaweed. The path crosses the top of a steep granite slipway and passes a few houses before ascending the cliff again. When you reach a large grassy field take the path closest to the sea, which gives way to another steep descent, past a holy well and down to the beach at Porthchapel. This is an unguarded, sandy beach with notorious currents and powerful waves. It is occasionally possible to swim but care should be taken. On up the cliff and past the Minack Theatre, an open-air theatre cut into the rock with shows taking place throughout the summer. 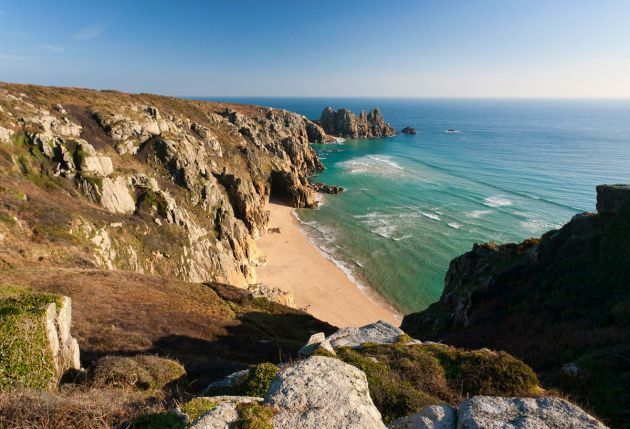 The theatre overlooks Porthcurno beach, another picturesque sandy affair that connects with neighbouring beaches at low tide to form a much-photographed tropical-looking panorama. It is occasionally possible to walk all the way along the sand to the Logan Rock, although more usually it is necessary to pick up the coast path again just behind the lifeguard hut. 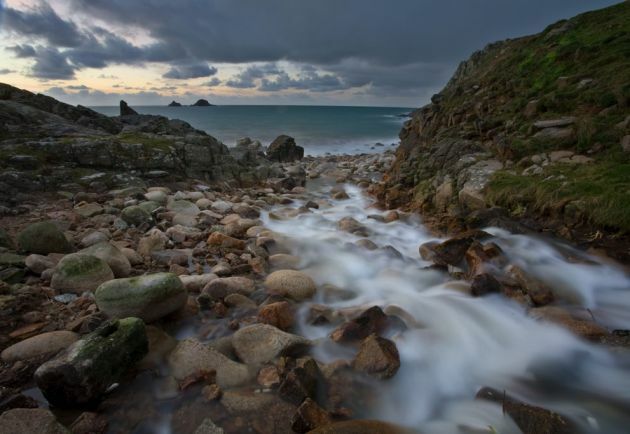 When there is a choice of paths take the one closest to the sea, which leads to the Logan Rock, unless you wish to spend the night in what must be one of the best-located campsites in Cornwall, in which case follow the stony track away from the sea to the village of Treen and ask in the café or the pub. Either detour to visit the famous Logan Rock (rocking stone), which is situated on another Iron Age cliff castle with well-preserved ramparts, or continue straight over the cliffs to the picturesque cove of Penberth, where the old granite slipway, fishing boats and fishermen's cottages have remained unchanged for centuries. There are toilets here but no shops or cafes. 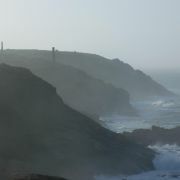 Climb up the path that leads from the slipway and on over the cliffs. A steep descent and ascent brings you to a fork in the path. Either continue along the coast or head inland a short way to a well-positioned campsite. Another, more gradual descent will bring you to a distinctive boulder-strewn beach at the mouth of a wooded valley known as St Loy. Home-made cream teas are available in season. Climb out of St Loy and on to Boskenna Cliff, the former home of Derek Tangye, author of a number of popular books about Cornwall. His house and land have now been turned into a nature reserve. 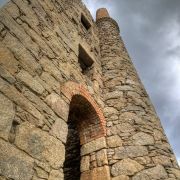 Past the distinctive, white lighthouse of Tater-Dhu and on to Lamorna Cove. 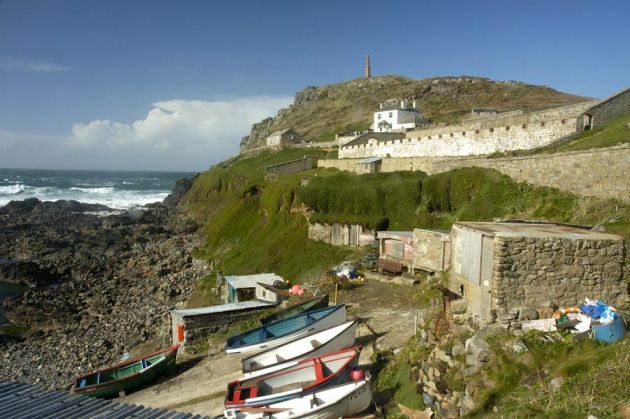 There is a café on the pier and a pub (The Lamorna Wink) further up the valley. 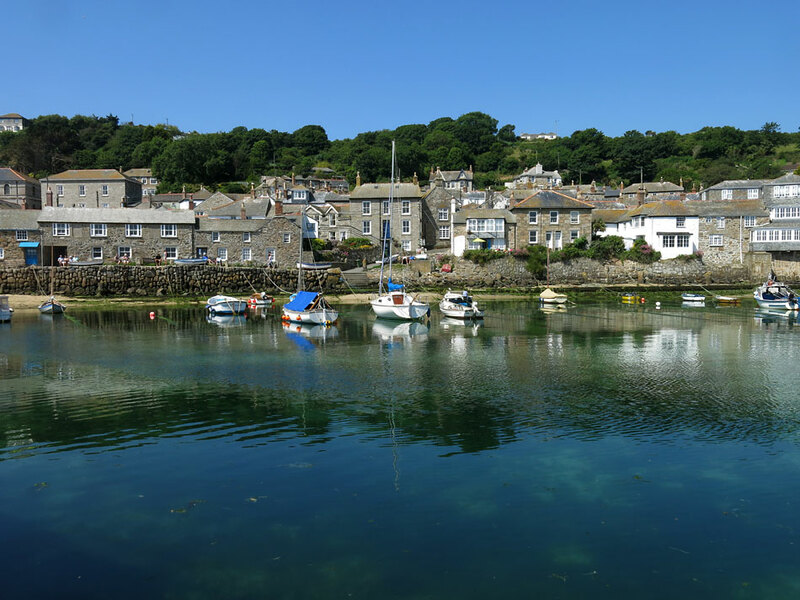 Ascend the cliff through an old quarry and on to another wooded nature reserve which leads to the archetypal fishing village of Mousehole, which is well worth exploring and offers a number of options for eating, drinking and sleeping, as does Newlyn, about a mile further on. 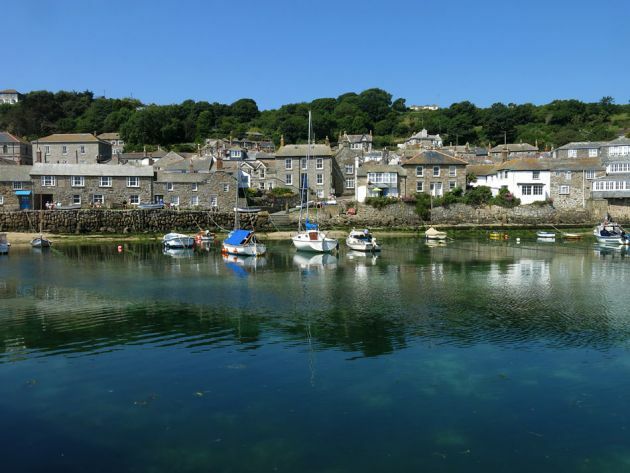 Stay as close to the sea as you can as the path makes its way through Mousehole and Newlyn to Penzance.